Troy Hunt, a web security expert and Australian regional director for Microsoft security publicized a Mega data breach of more than 87 GB of leaked passwords and email addresses. These compromised email address were from data breaches coming from different sources. The data was collected and uploaded in the popular cloud service Mega, which contained over 22 million unique passwords apart from the 773 million email addresses. These records could be accessed by anyone with an internet connection, thereby making it a wide-reaching Mega Data Breach. GajShield is an expert UTM provider specialized in Context based security solutions. Their solutions are well suited to today’s mobile and cloud-based environments as they respond more intelligently and quickly to unexpected situations. By understanding the context of a user request, the security system or firewall can adjust the security response and control how information is delivered to the user, greatly simplifying an increasingly complex computing world and proactively addressing the issue of security breaches. Why the Future of Firewall Security will be Context Based? The first data breach of 2019 was reported less than 24 hours into the New Year. Not a good start for data security, but has not come as a surprise. Priority for all enterprises has to be data security and how to secure its critical assets. The details of an estimated 30,000 Australian civil servants were stolen when a directory was downloaded by an unauthorised third party – believed to have phished the email address of a government employee in the state of Victoria. WILL A FIREWALL BRING ME MORE BUSINESS? Over the weekend, a friend of mine asked me this question over dinner. Knowing that I belonged to the security field, it was kind of a way to mock at me. Do we keep a security guard in our companies? Do we loose or gain business by keeping one, why should we invest in a firewall than. Isn't a firewall similar to a security guard? Others too joined in the chorus. They too started asking on whether my data will ever be attacked or hacked? And why would anyone be interested in my data? What will I loose, if my data is breached? Is the investment in a firewall worth it. Though there was certain arrogance but the anxiety about data security was quite evident. Interestingly everyone related a firewall to a security guard and hence the understanding of data security was missing. For them investing in a security guard in an office for the fear that someday, someone will attack was a wasteful expenditure. Wouldn't the guard be sitting idle for most of his time, eventually being used for other office work rather than being used for protection? Similarly, will a firewall help him to increase his business? If not, why should he invest in one. According to a recent report from online skilling provider Simplilearn, digital transformation of industries will contribute $154 billion to India’s GDP by 2021 and will create thousands of high paying jobs. The Draft Protection Bill, which has mooted a ban on the transfer of sensitive personal data outside India and is likely to be tabled in the winter session of Parliament, is all set to trigger an explosive growth in the Indian data center market. 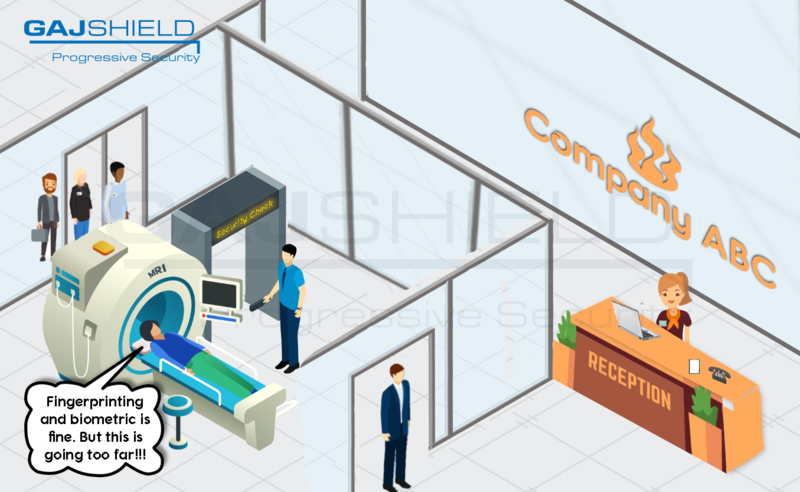 GajShield has always been a leader in innovating security technologies like Context based Data Leak Prevention, Cloud Security, Zero-day Anti-Ransomware, Oops based Management and has been ahead of the security solution curve which helps to create real security solutions of today’s and tomorrow’s enterprise. Going beyond traditional solutions, GajShield’s Data First security strategy approach has helped enterprises to secure cloud and SaaS applications. GajShield provides an integrated, best-of-breed and comprehensive cloud functionality which allows the organizations to create common, granular policies for roaming users without impacting end-point performance. GajShield believes its product innovation is setting the pace for the rest of the industry, and has led to its recognition in Gartner’s Asia/Pacific Context: ‘Magic Quadrant for Enterprise Network Firewalls'. Apart from improving security, GajShield's 'Contextual Visibility and Protection' is able to indentify threats with little impact on performance, unlike traditional Next Generation firewalls. With the help of contextual visibility, GajShield's security engine are able to quickly identify suspected traffic and send it for further evaluation without reducing performance of network traffic. Contextual visibility help to identify zero day threats protecting with reduced false positive and higher accuracy. GajShield’s context sensitive Data Leak Prevention system understand web application by creating context which helps an enterprise to setup policies based on the SaaS or cloud applications instead of IPs or organisation users, which have no relevance to the above application. Each context bring higher visibility which helps to protect data leaks from an enterprise. For example, you can create policies based on the ‘From’, ‘To’, ‘Subject’, ‘Email Data’, ‘Attachments’ of SaaS based email applications like Google, Yahoo etc, preventing intentional or un-interntional data leaks. Most of us would have seen the movie, Mr. India during our childhood. If not, do watch the movie. It is one of India’s first well directed science fiction movie. In short, the story is about Mogambo who wants to conquer India. He is looking for a secret formula using which an invidiual can become invisible. Fortunately for us Indians, the secret formula lands with Aruna Verma (Anil Kapoor), the hero of this movie and he saves us from Mogambo. What would have happened, if Mogambo would have got access to the secret formula of invisibility? He would have destroyed us as how would our arm forces or police machinary fought an invisible enemy. An iconic movie and very relevant for the security industry. Unlike Mr. India, in cyber security, Mogambo has always had the secret formula of invisibility. Not only he, but his attacks too are invisible to us. They breach our network and data, easily without us even being aware of it. Existing firewalls are fighting an invisible enemy without having the tools to idenitfy these threats and defend against them. Like Mr. India, we need a red glass through which we can see these threats. A tool, which will help in providing visibility and bring context to the data that is flowing through our network, enhancing our capibility to identify external and internal threats. US-based question and answer platform Quora announced that personal data of almost 100 Mn Quora users was breached with a “malicious” third party gaining unauthorised access to one of the company’s systems. HDFC Bank on Monday said it is restoring its old mobile banking on IOS and Google Play after its new app crashed and was not available for more than a week. HDFC Bank clarified there has been no data breach, loss of customer data or security issues with the mobile application. The Securities and Exchange Board of India (SEBI) on Monday came out with a cyber security framework for stock brokers and depositories. The guidelines would come into force on April 1, 2019, SEBI said in a circular. "As part of the operational risk management framework to manage risk to systems, networks and databases from cyber attacks and threats, stock brokers/depository participants should formulate a comprehensive cyber security and cyber resilience policy document encompassing the framework," the circular said.